60's and 70's Soul, Funk, Disco, Party-Rap and Boogie from Arkansas's Legendary Independent Label. 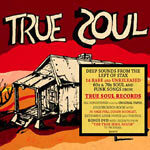 14 Rare and Unreleased cuts from the True Soul vaults. 56 page full color booklet contains never-before-seen photos, ephemera, extensive liner notes and a candid interview between producer Eothen ''Egon'' Alapatt True Soul label-owner Lee Anthony. All tracks remastered from the original master tapes. Bonus DVD with excerpts from the True Soul Revue TV show.